By Karrar Haider in Desktop. Updated on November 23, 2017 . If you have limited internet data plan or have an old PC that can’t handle your browsing needs, then you could try make your browser more resource-friendly. This means there are tweaks you can do to make your browser use fewer resources. I’m using Opera browser to demonstrate how to do this, but the tweaks below can also be done in other popular browsers. You just have to search for the options yourself and may also have to get help from third-party browser extensions. Good To Know: Do keep in mind that a resource-friendly browser is snappier and also loads web pages faster. If you are looking for faster browsing instead, then the below tips will be helpful. I always keep images disabled while browsing and there are many good reasons to do so. Images are heavy and use loads of internet data, most of them are only for attraction, they reserve huge space on web pages (more scrolling) and I also personally find most images to be distracting. Focusing on the resources side, an image heavy page is usually of 2-5 MBs. By disabling images, you can make that webpage use only 200-300 KB. Of course, this will lead to using fewer internet data and also speed up page loading time. Both Opera and Chrome have this setting built-in, but you may have to use a third-party extension in other browsers. Here, under the “Images” heading, select the option “Do not show any images". You can also click on the “Manage exceptions” button below to whitelist websites you want to see images on. Embedded videos, widgets, and other flash-based content you see on webpages are all plug-in content. These contents are heavy on both PC and internet resources — and they are not always useful. Set plug-in content to “Click to play”, and no plug-in content will be loaded automatically on web pages; a simply click on it will play it. This option is available in almost all browsers. Go to “Websites” section in the “Settings“. Select the option “Click to play” under “Plug-ins” heading. Now you will see a play button on web pages with plug-in content. Opera has a built-in data compression system that will compress unencrypted webpages (HTTP) to decrease their size. Thus the webpages will eat less internet bandwidth and also load faster. From the main Opera menu at the top left corner, select “Opera Turbo” to turn on this feature. In Chrome and Firefox, you can use the extension Data Saver for Chrome and Google DataSaver for Firefox. Note: While using this feature your unencrypted data goes through the service provider’s servers (Opera or Google in this case). Privacy conscious people may not be comfortable with this approach. Most other browsers also have this option baked into settings. Ads power the free Internet we get to enjoy today, but when you have to budget the resources your browser can have access to, ads are probably top on the list of things that have to go. You can use the popular Adblock Plus extension that supports most popular browsers. In Opera you can take advantage of the built-in ad blocker that is lighter than any other third-party ad blocker. Go to “Basic” section in Opera “Settings” and enable “Block ads” option. Just like other ad blockers, you can create custom block lists and whitelist website. Blocking ads is a great way to save resources, but do remember to whitelist websites you care about as they depend on the ad revenue to offer their services. I’m not recommending that you disable all types of cookies as cookies allow websites to identify you when you revisit them and help you easily login or continue where you left off. However, blocking third-party cookies can be good as they are usually used by third-party websites to track your activity for analysis and advertising purposes. You can disable third-party cookies in all popular browsers. In Opera, move to “Basic” section in the “Settings” and select the option “Block third-party cookies” under “Cookies” heading. Of course, you can also completely disable cookies from the same options, but it will surely affect your browsing experience. Opera has a built in battery saver mode that puts less pressure on the CPU and makes other tweaks such as pausing theme animations, reducing background tabs activity and pausing unused plugins to increase laptop battery life up to 50%. This mode will not save RAM or Internet resources, but making less use of CPU is a good thing as well. In my normal Opera usage without battery saver mode, my CPU spikes to as high as 36%, but with battery saver the highest spike was 14%. Also, the spikes were less frequent while in Battery saver mode compared to normal mode. To enable Opera Battery saver, go to “Basic” section of Opera “Settings” and check the checkbox next to “Enable battery saver“. If you have a laptop, Opera offers different trigger options to automatically enable battery saver function. When hardware acceleration is enabled, your browser will take advantage of your PC GPU to play browser-based games, videos and other heavy media content. Of course this means that hardware acceleration will put pressure on the GPU (video card). Hardware acceleration should be disabled if you think your PC GPU should be used for more "important" things (like PC games) than the content inside the browser. All popular browsers support this feature, in Opera you will find this option in the “Browser” section of the “Settings“. Under System, disable "Use hardware acceleration when available" to save PC resources. Enable it if you want to speed up the browser. Extensions use a lot of PC and internet resources as they continuously work in the background to provide their services and also exchange data. Try to keep only the important extensions in your browser and remove all the unrequired ones. I also recommend you disable the extensions that you use infrequently. Whenever you need service of such an extension, just enable it, use it and then disable it again. If you use a VPN service to browse anonymously and access blocked websites, then Opera’s free built-in VPN might entice you. VPN software are usually heavy on your PC resources and slow down browsing by a lot; and not to mention the monthly fee you have to pay. Opera’s built-in VPN is extremely light, has very small impact on browsing speed and it is completely free without any strings attached. If you will use Opera’s VPN, you are saving resources and money! Go to “Privacy & security” section in Opera “Settings” and check the checkbox next to “Enable VPN” to enable it. Now you will see a “VPN” at the start of the address bar that you can click on to enable/disable VPN and choose virtual locations. This tip will only be useful for you if you are already using another VPN service. If you don’t use a VPN service (and don’t know its caveats), then enabling Opera VPN will actually lead to slowing down your browsing a bit and putting more pressure on your PC. Along with all the above tips, you should also make a habit of cleaning browser data every now and then to keep your browser light. Too much browsing data will make your browser slow and heavy on the PC. All browsers have options to clear browsing data. In Opera, you can move to “Privacy & security” section in “Settings” and click on “Clear browsing data” button under “Privacy” heading. 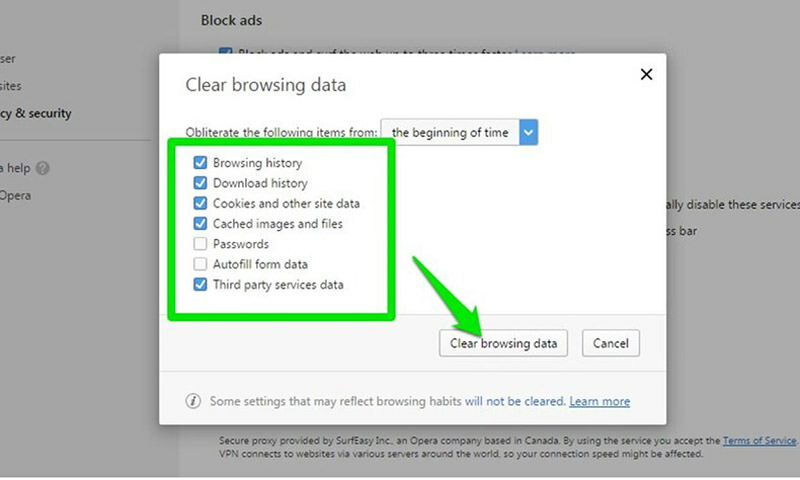 You will see all the data that you can delete, just check the checkbox next to what you would like to delete and click on the “Clear browsing data” button below to delete it. I don’t recommend you delete passwords and form data as it is important for automatically logging into websites and filling forms. Is your browser lighter now? After following all the tips above, your browser should be light as a feather. These tweaks do lead to sacrifices in features, but in most cases it should not affect your browsing too much and you should be able to browse smoothly. Do let us know in the comments which tips you followed and how they worked out for you.